Slavic hospitality is very well known all over the world - the people are incredible friendly! And during this tour you will experience it for yourself. 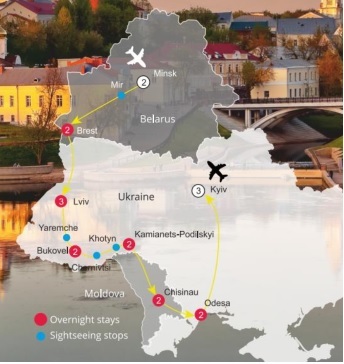 We invite you to discover three amazing countries: Belarus, Ukraine and Moldova. Including a visit to the country that de jure doesn't exist. You will discover the ancient and current life of Republic of Belarus. Ukraine will surprise you in so many ways: the nature, the architecture is colorful and majestic, the castles are spectacular. Pleasant activities in the Carpathians are waiting for you! Tiraspol - the capital of an unrecognized country - will take you back to the USSR! Local English-speaking guides; Expenses of a personal nature such as: beverages with meals, camera fees, etc. Tour Type: Active - Walking tours in the cities, some of the cities are hilly or their historical center made of cobblestones. Some hikes, few elevations in the mountains, busy comfortable schedule and some long rides. Special notes: Some of the drives between cities and countries are long and many roads in Ukraine/Moldova are not in good paved conditions (even though many of them are being repaired) and for a few of the driving days the tour will start quite early and end up quite late in the evening reaching the next destination, so patience is required for such long days. Lodging level: Hotels are 3-4 stars with additional amenities, English-speaking staff, service and comfort level acceptable to western standards. Please, check the list below. Visit their website to find out more about services. Arrival, meeting and transfer to a hotel. Check-in, free time for rest. Walk to a restaurant. 09:00 am – 06:00 pm Discover Minsk: from the moment of foundation to nowadays. 10:00 am – 04:00 pm. This day is dedicated to the mountains and its people – Нutsuls. During your free time in Yaremche, the pearl of Carpathians, you can shop in one of the local souvenir markets. 09:00 am – 01:00 pm. Start your day with a walking 3-hour tour around downtown visiting its historical places and strolling the age-old streets: Deribasovskaya, Pushkinskaya, Rishelievskaya and Landzheronovskaya. You will see masterpieces of architecture and art of buildings, Opera and Ballet Theatre, and also historical buildings, where the archeological and marine museums are situated. Strolling along the Primorsky Boulevard it’s your chance to see an ancient building of municipal Duma, count Vorontsov palace with colonnaded entrance and the monument to Duke de Richelieu and the famous Potemkin stairs. They are the main entrance to Primorsky Boulevard from the seaside from where you witness the fascinating view to the marine terminal and the seaport. After lunch - free time. 09:00 am – 01:00 pm. We visit Kyevo Pecherska Lavra with its caves – the most ancient monastery and UNESCO Heritage site, then exploring the Motherland Statue complex and WWII museum. During the tour you will also see impressive administrative buildings, House of a crying widow, Chocolate House and Red Castle, stone jungles and many others. Back to the hotel. Free time. Optional*** tour to Mezhyhirya Residence - a house of Ukrainian former president. Pick up from the hotel and transfer to the airport for your departure flight. ** Odessa Catacombs tour: Catacombs are underground labyrinths created during the period of the city construction over 200 years ago. They are situated mainly in Nerubaiskoe village (15 km from Odessa), originally created during mining of hardware materials as shell rocks that were used to build the city. Odessa Catacombs are some of the longest in the world and played an important role during the WWII as a shelter for the partisans. *** Mezhyhirya tour: Have you ever wondered how corrupted presidents live? Here is one of the examples and it’s a great opportunity to visit the residence where former Ukrainian president Yanukovich lived. This place is now called the museum of corruption, which is stunning by its impressive luxury life, incredibly vast territory and nonsense of human greediness. We have all rights to change the order of activities or visited places, as well as hotels to similar ones due to unforeseen weather conditions or other reasons in order to make the itinerary run smoothly. We reserve the right to apply either trip surcharge or service reduction during the tour if a group doesn't meet minimum amount of participants in order to run the tour. Cancellations must be received in writing, and it will be processed according to the date when the written notice is received. Notice by email or via phone calls are not accepted as the final notice. The arrival is the date when the tour starts means your arrival date to Ukraine (Moldova or Belarus).